I've been excited about Pixi Beauty's Tinker Bell inspired collection for months now, and I received the information below earlier today and wanted to pass it along. The PixiGlow Collection is a Limited Edition Target exclusive that will be available January 29 at Target online, and in all Target stores in March. There's even a nail polish (not pictured)! 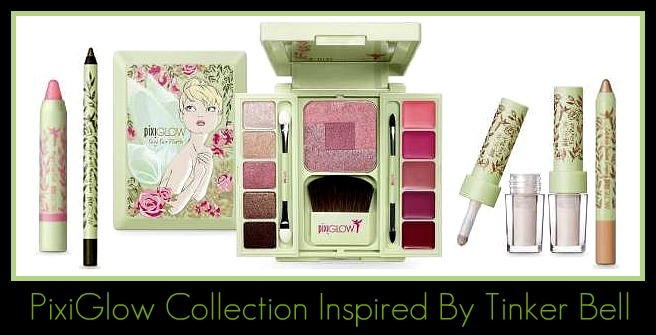 If you're a Tinker Bell fan, check it out! It doesn't sound like this collection will be available on the Pixi Beauty web site, but I wanted to mention that if you'd like to receive discounts from Pixi, sign up for their eMail on their site. I often receive up to 30% discounts, and they also offer free shipping at $50.00. Right on trend, Pixi creator and Target beauty design partner Petra Strand has teamed with The Walt Disney Co. to design the limited-edition PixiGlow collection available exclusively at Target. Inspired by Disney’s most iconic fairy, Tinker Bell, Petra worked closely with Disney character artist John Quinn in a unique collaboration. Together they re-imagined the Tinker Bell of childhood memories into a vintage-inspired beauty who will appeal to women of all ages. Petra shares, “In collaboration with Disney, we created a unique Tinker Bell collection that captures the fresh-faced, glowing, and timeless beauty of both a Disney icon and the Pixi brand by reinforcing that makeup simply enhances and perfects your natural.” Ranging in price from $8.00 to $34.00, the PixiGlow collection will launch on Target.com on January 29 and in all Target stores in March. omg my daughter would dieeeeeee lol she's only 2, but loves makeup AND tinkerbell! the perfect storm! Pixie products have never called out to me...until now! I've never used this brand. Looks adorable. I'll wait to see this on YouTube before I get excited by it.